Last weekend Ben and I attended Operation Sting. Hosted in Northbook, IL on Nov. 5-6 , this 30 player, two-day tournament is quickly becoming the premier Bolt Action event in the Midwest. Considering Ben and I played a total of ten games over the weekend we will not be doing a full write-up for each game. Instead, we will pick a highlight from each game along with the final outcome. 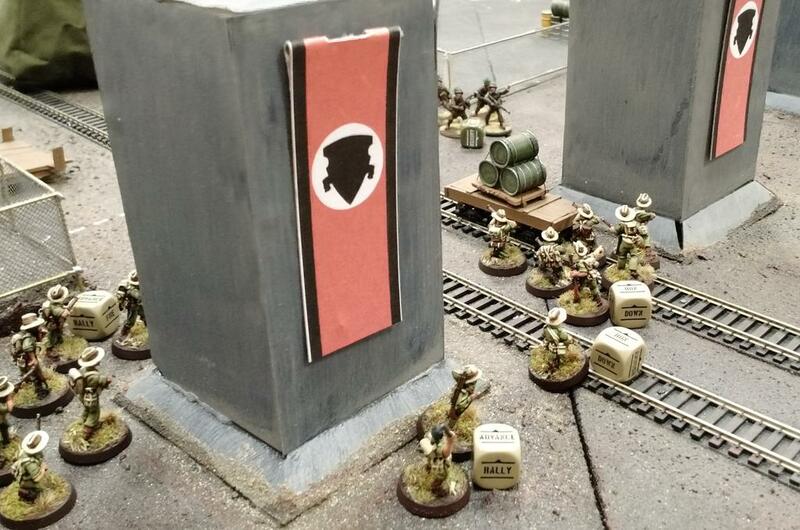 Andrew: My first game was fought aginst veteran Germans on the fantastic sub-pen table. My highlight from this game was when my Sherman V aced a Panzer III from across the table on its first shot of the game! The Panzer had been holding down the left flank but with it gone I was able to run several Chindits off the table edge to secure a big chunk of victory points. 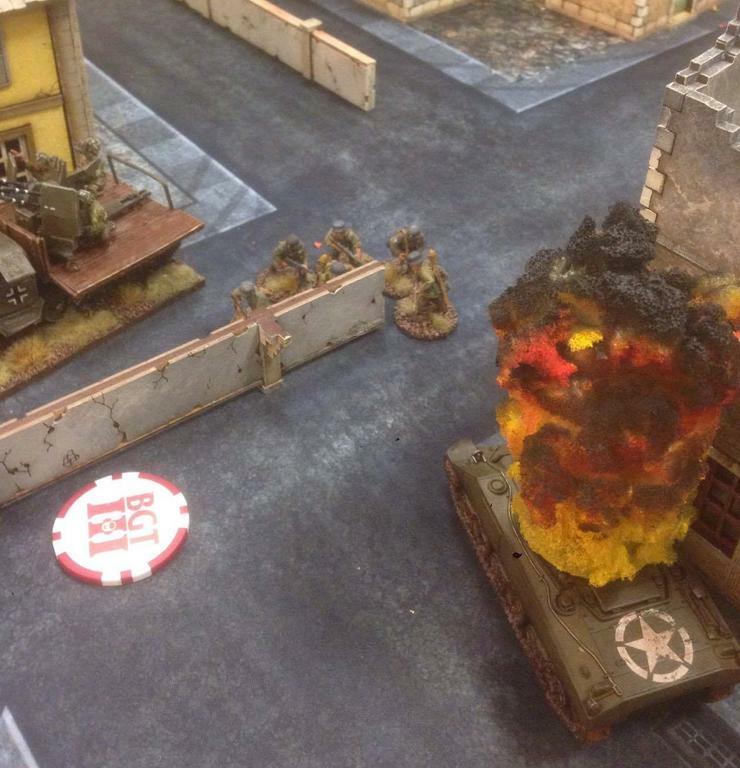 Ben: My initial game I faced off against a Finnish army on a desert themed table. Unfortunately, the Finnish skis weren’t working all that well in the sand, and that, combined with some impressive accuracy by my Marines, managed to clear out a decent amount of Finnish infantry fairly quickly. An early shot from my Sherman was able to immobilize his only armored vehicle, an armored transport that was intended to haul his howitzer around. Unfortunately for my opponent, the tow was immobilized directly in front of his howitzer as well, meaning he couldn’t fire over open sights anymore and was relying on indirect fire through the entire game against a very mobile USMC force, making it much harder to land hits despite a position with strong sightlines. Near the end of the game I was able to roll my Buffalo off the other end of the table, carrying some infantry inside it, to grab the victory. 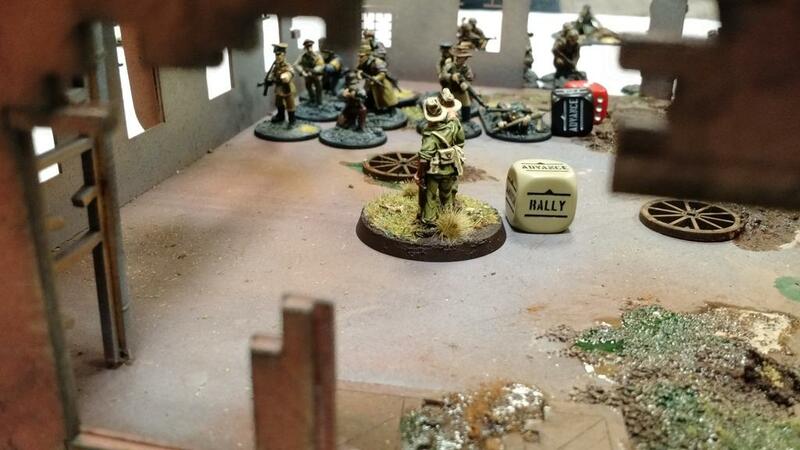 Andrew: During game two my Forward Artillery Observer, who is always the x-factor in these games, calls in a fire mission right in the middle of the table. The goal was to but up an artillery screen between the middle objective and the German forces closing in around it. And that worked! The artillery ended up putting multiple pins on multiple enemy units and even stopped a Puma from activating for the rest of the game. However, I forgot that I had a squad of Chindits in the very large building that was within the blast zone and ended up destroying the entire squad. Note to self, a heavy howitzer strike on a unit inside of a building means certain death. Ben: Game two found me facing off against Germans in a very dense urban map, absolutely full of buildings. My opponent wisely picked the side of the table that had 2 roads leading onto it in fairly straight lines, allowing his infantry (riding along in trucks) to move up the field quickly into strong positions. In the first turn he left his anti-aircraft vehicle off the table in his reserves, allowing me to call in an airstrike destroying his AT gun that had been placed to deny my Sherman the right side of the board. His AA truck quickly got vengeance though, as rather than waiting for another plane to show up and shoot it down, he riddled the building my Forward Air Observer was sheltering in with HE rounds from his four autocannons, nearly destroying the building and shredding my observer team. I was able to move my Sherman up that side of the board and fire back at the AA truck, but I missed and the roads allowed him to rush two squads wielding Panzerfausts up into a position to kill the Sherman on turn three. I was able to hold the opposite side of the board for a majority of the game, but after losing the right flank along with the Sherman (and also a few key failed leadership checks when trying to activate units), I fell dramatically behind on manpower and was unable to contest or hold enough objectives to manage a draw, and ended up with my only loss of the tournament. A very fun game, and one in which I was able to learn firsthand how horrifying autocannons are in second edition. Andrew: In order to win a game of Demolition you have to blow up your opponents base while at the same time, stopping him from doing the same to you. In this game, the defense of my base fell to a two-man veteran anti-tank rifle team. After putting shots on multiple enemy units the entire game they launched a desperate assault on a German sniper team during the last turn of the game to ensure no enemy units could capture the objective. After three rounds (!) of furious melee combat all combatants perished and the golden Buddha was kept secure. Ben: Game three I fought against a Japanese army, on a map that had open fields on each side and a small town built along a road leading diagonally across the middle of the map. I had positioned my objective in the fields on the right side of the map, while my opponent placed his near the center behind buildings in the town. The Japanese had brought several of their suicide anti-tank teams (basically a guy holding a mortar or artillery shell and running up and slamming it into a tank) and positioned them throughout the town and behind a building in the nearby fields, severely limiting my potential movement with my two vehicles (a 75mm-armed M4 Sherman and a LVT-4 Buffalo). Neither side was able to make much headway into their opponents area. Japanese infantry advanced behind smoke clouds deployed by their mortars as the Sherman dueled with a Japanese tank destroyer on the roads in the town. My Buffalo (filled with a veteran unit loaded with close-range assault weaponry as well as a flamethrower team) outflanked and was able to do significant damage to enemy positions on the right side, successfully protecting my own objective (at the cost of the Buffalo to an AT kamikaze). The game ended in a draw as neither of us were able to complete the objective. Andrew: After failing to arrive via reserves for four turns, they must have been tired, my light artillery rolls onto the battlefield and sets up to cover a road going down the middle of the table. The following turn the Hungarian version of the StuH 42 rolls into view. Firing over open sights the light artillery rolls a six to hit, a six to damage and a five on the damage chart to knock out the enemy tank. Better late than never boys! 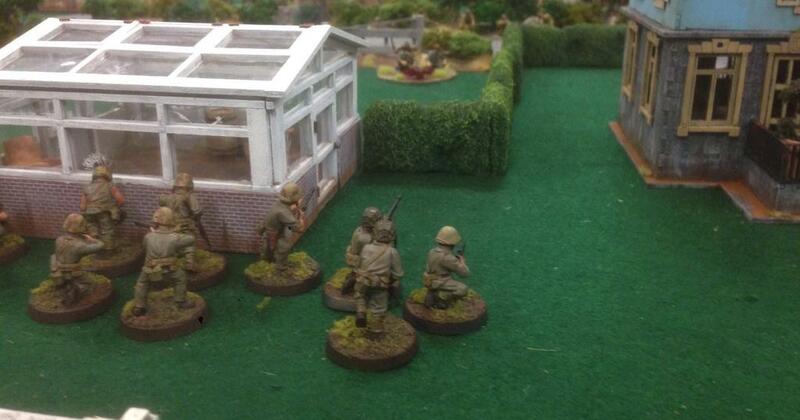 Ben: Game four was against another Japanese army on a table resembling a small town with bocage/hedge style terrain. The goal of this mission was to capture intelligence from the two objectives and hold it for the entirety of the game. An airstrike called in turn one (arriving turn two) managed to destroy my opponents howitzer tank and pin his nearby AT gun, while a duel between snipers ended with my sniper killing his on turn two and then focusing his attention on the enemies anti-tank rifle team, eliminating that on turn three. This player had also brought a collection of suicide anti-tank teams, but due to the road running through the center of town (and the lack of ranged AT after his vehicle and rifle team were destroyed) my Sherman was able to run rampant up and down the roads, including an attempted tank shock assault through two squads (both of which were able to hold despite having multiple pins on them). The Buffalo was able to deliver my veteran Marine squad to the objective on the left side of the board and they captured the intel and quickly retreated to the rear of the board, protecting it out of range of Japanese weapons. On the right flank at the other objective, a ferocious firefight ensued as Japanese infantry tried to push forward to their objective, successfully making it there but then failing to pick up the objective in their first attempt, leaving them open to return fire from the three regular Marine squads that were advancing, unloading BAR and rifle fire, while my sniper continued to pick off important targets, including the enemy Captain. In the end I was able to hold the first objective that I had retrieved and prevented the Japanese from securing the other one, giving me the victory. Andrew: Final game of goodness this one was something else. I played against a German Pioneers army containing no less than eight flamethrowers! Really not much else to say. The flamethrower teams and pioneer units swarmed forward and caused my units to fail one moral check after another for a pretty one-sided game. There were a few times when it could have tipped back in my favor but a combination of bad luck with order dice and my inability to destroy the enemy transports created a non-game. However, one Chindit NCO survived the battle even though his squad was hit by two flamethrower teams and assaulted by a pioneer squad. One thing I learned at Operation Sting is that Chindits do not go down easy. Ben: My final game was against Germans on an open airfield map themed around Hydra from Marvel Comics. A very open and dangerous field to try and cross, but this particular mission was about eliminating opposing units. My sniper was able to eliminate my opponents artillery after a few turns, but heavy firepower from German units equipped with LMGs and assault rifles threatened my right flank fairly early, while a Puma was able to eliminate my Buffalo. My Sherman was able to advance on the left flank since his primary AT was the Puma on the right side, and while I was able to severely damage several units I was having trouble getting the killing blows to knock them off the table. The right flank was a mess, with squads from both sides dying, but the left side was mostly stagnant despite the presence of the Sherman, which spent the game trying to eliminate infantry and a German light tank that was able to Recce into cover. Unfortunately we were ended due to the time limit expiring early in our final turn, preventing me from getting a final chance at eliminating the multiple German units that were down to 1-2 models each. In the end, my opponent eliminated 4 of my units and I eliminated 3 of his, resulting in a draw (a victory requires killing 2 more units than your opponent). Andrew: Operation Sting was fantastic. The months of preparation in terms of both hobby and practices games paid off as I finished 3-1-1 and was voted Best Painted for the Allies! I was both surprised and thrilled to take home one the painting awards as I was gunning for it but I knew the bar would be set high. After two days of intense gaming I walked out of there with a smile on my face and am already looking forward to next year. Brent put on an incredibly well run event and I hope to be a part of the future of Operation Sting. Ben: Overall, a very fun tournament with great opponents, one that I’ll be happy to go to again next year. I ended up 2-1-2, and the tournament organizers were able to secure enough prizes that everyone was able to get something. I came home with a ruined European-style townhouse made (and prepainted) by Miniature Building Authority, who make great terrain for Bolt Action. 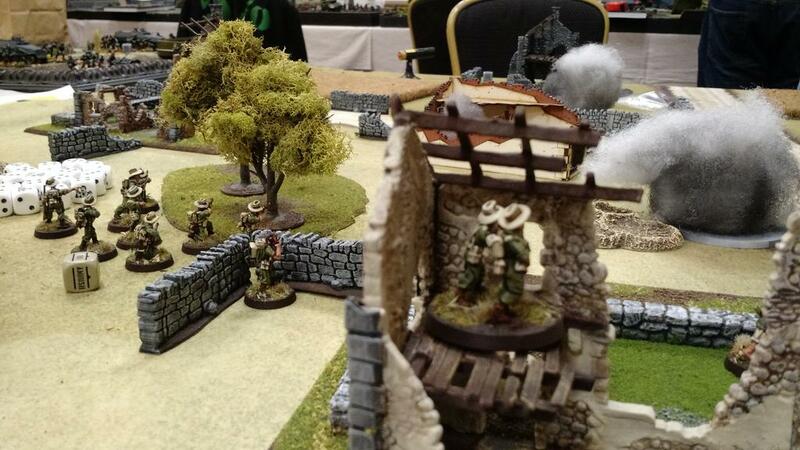 I look forward to playing again at Operation Sting next year, although I’m not yet sure what army I’ll be fielding. Possibly US Airborne since I recently received all the new plastics from Warlord Games, but as it’s a year away I have some time to make a decision. Full results from Operation Sting 2016 are available on the event website.